MouselookHandler can lock you into mouselook, so you don't have to press the right mouse button constantly. 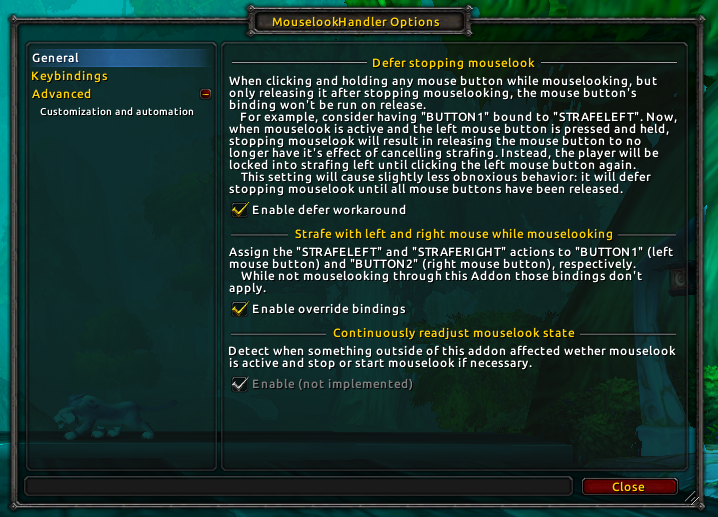 It also allows rebinding your left and right mouse buttons to something new, while mouselook is enabled. By default, it rebinds them to strafe left and right. You can set up custom conditions that control when mouselook should be toggled as well. For example, to have mouselook auto-enabled while moving. Access the in-game configuration panel using the /mouselookhandler or /mh chat command. Can you do a custom LUA that auto enables the addon during combat? Would be possible to re-assigned left-click to use a key button while mouselookhandler is active and go to normal click use while not moving? This addon its soooo good! Thanks sooo much for create this addon! So much fun playing WoW with this addon... BEAUTIFUL! So I have a bit of a unique issue. I also use Opie (mouse-over spell wheel) with my shaman. While the mouse look is awesome, I can't get to my totems that are binded to Opie. Could we have the option for a "temporarily disable while this button is held" please? It would be amazing if you could! I would make Opie and the disable on the same button so that the cursor would release just long enough to trigger the spell. So far I just have it only mouse lock while I'm moving so I have to completely stop so that Opie will work. I'm trying to figure out how to use this to disable strafing while in mouselook. So that my right and left keys turn me right and left. You mentioned it in the description but I can't seem to make it work. I've tried enabling overrides and setting an over ride for "a" to "TURNLEFT", but when I try it I just strafe left. I'm using an Oculus Rift to play WoW in first person VR and the strafing is annoying when I want to steer. can someone help me, seems like an easy fix but i cant figure it out, i just want to be able to move forward while mouse look handler is active. I like strafee left to be mouse button 1 and strafee right to be mouse button 2. But when i hold them both down i would like it to move me forward, any help please, thanks in afvance. I'd like to see a way to have both mouselook and the cursor active at the same time. Just lock the cursor in place and let me click it to select the things under it - like the crosshairs of an FPS game.